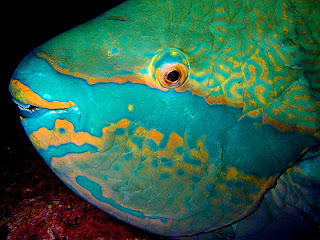 Uhu, pronounced: OOO - HOOO, is the Hawaiian word for parrotfish (scaridae). There are over a dozen varieties of parrotfish found in subtropical oceans throughout the world, seven in Hawaiian waters. I first discovered the parrotfish in Bora Bora while dining at a local French restaurant. The fish was simply sauteed in lots of butter and garlic and served with local fresh vegetables. It was so delicious that I went back again and ordered the same thing a few days later. Here in Hawaii, the uhu feeds on algae growing in shallow waters on the reefs. Their mouths resemble the mouth of a parrot, probably because of all those teeth. That's why they call the uhu a "parrot" fish. Some locals like to say these fish have much to do with making our sandy beaches by grinding the coral and small lava rock with its teeth to get at the algae growing on them, then spitting the sand back out. This process actually helps the reefs by preventing the algae from choking coral. The uhu are very good at grinding rock because they have two sets of teeth, the second set is located farther down its throat. The uhu is also very interesting because it starts out life as a female, red in color, and then eventually turns into a blue male as it gets older, just like the photo above. It's kind of like a transsexual without the medical treatment. This fish is rarely consumed in the continental U.S., but in Hawaii uhu is especially popular on the dinner table and are a prime target of spear fishermen, especially at night when the fish sleeps. In order to eat this delicious fish, you have to clean it, which isn't easy. Forget your normal fish scaler, Hawaiians use a spoon, and they do it outside for a good reason. The scales are large, with the consistency of a thumbnail. In order to get the tough scales off, it must be done with gusto, and because of that, they fly everywhere like no other fish scales. The blue male is the best to eat according to locals. The flesh is white, tender and sweet, making it delicious simply sauteed with garlic-lemon butter and capers, steamed with lemon grass and thin slices of lime, grilled covered with mushrooms, garlic, and mayonnaise, or the filipino soup, "tinola" style, stewed in ginger, onions, chayote squash and watercress, or simply fried in egg, corn flower, sea salt and black pepper. Some locals say uhu is best served “steamed” – head on, but it depends on who you talk to. One popular Hawaiian way of preparing this moist, flaky fish is to grill it (see recipe below). My feeling is that you can't go wrong, anyway you cook it. I first had grilled uhu at a local luau here on Moloka'i. I was amazed that the cook used seasoned mayonnaise, which was spread all over the fish prior to grilling. It tasted amazing! Preheat the grill. Place a large piece of aluminum foil on a flat surface. Place 1 ti leaf on top, followed by the fish. Lightly rub both sides of the fish, and its cavity with sea salt, pat dry with a paper towel. Mix together the mayonnaise, mustard, garlic, ginger and black pepper in a small bowl until blended. Spread the mayonnaise mixture all over the fish, getting into all the scores and cavity. Combine the sausage, mushrooms, and green onions and stuff the mixture into the fish scores and cavity, flipping and stuffing into the other side as well. Top the fish with the second ti leaf, and then another piece of aluminum foil, tightly wrapping it all up to form a pouch. Grill the fish for 15-20 minutes on each side, until the flesh is white, not opaque. Carefully unwrap the foil and place on platter, including juices. Squeeze lemon/limes over fish and lightly spoon Vietnamese fish sauce or diluted Patis over fish. Garnish with reserved green onions, cilantro and sliced cherry tomatoes. Makes 2-4 servings. Steamed uhu is very similar to grilled except you cook it in your oven. Basically they are both steamed in the foil, but you do get a little smoky flavor when you grill. The steamed version has no sausage added, and uses basil as an added flavoring. There are many ingredient variations to these recipes. Place the fish on a plate. Using a knife, make diagonal slits in the body on both sides of the fish. Sprinkle with sea salt, inside and out. Place garlic and ginger in between the slits. Sprinkle some pepper on both sides. Coat with the mayonnaise. Stuff the cavity with the tomatoes, onions and basil. Squeeze a little lemon juice on top. Seal tightly with heavy duty foil, and place in a pre-heated 350˚F oven for 45 minutes. This cooks best when placed on a rack on top of a baking sheet on the oven's top shelf. When cooked, garnish with chopped cilantro and green onions. Makes 4 servings. Note: This recipe works well with other whole fish such as sea bass, snapper, and even salmon. Makes 4 servings.